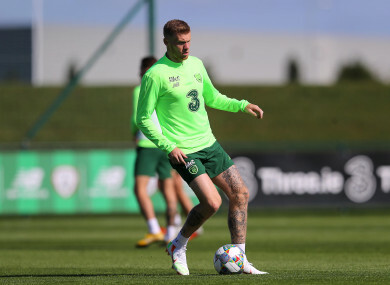 MARTIN O’NEILL HAS defended Ireland international James McClean after the player’s controversial tweet in relation to Declan Rice. After it emerged that Rice was having doubts about his international future with Ireland, McClean made his feelings known on the issue. While McClean was criticised in some quarters for potentially exacerbating the situation, the Ireland boss did not join in the criticism of the winger. “James has spoken to Declan Rice,” he said. “James is very strongly in favour of him coming. Very strong. He sent a text message strongly in support of Declan coming here. Declan has made a great impression here. He has done very well at senior level, as he has done at underage level. O’Neill continued: “I do want to say one thing to you. The dressing room here: we couldn’t have got to the Euros, and we couldn’t have got to the playoffs — gone from fourth seeds to second to qualified to the playoffs — if we didn’t have a strong mentality and vibrancy and really decent ethic within our squad. We are short of natural talent, so we have to make up in other aspects. In terms of the spirit of the camp, the spirit since I’ve been here, it’s been without reproach. Things do happen, some arguments develop into something stronger, nothing more than that. While many critics now expect Rice to declare for England, O’Neill is still holding out hope that the West Ham youngster will line out in a green jersey again in future. “I think let him just consider it for a little while. Let him consider the pluses and minuses. Hopefully there are plenty of pluses for us and the number of caps he could achieve for us. Email “O'Neill defends McClean after controversial Rice tweet”. Feedback on “O'Neill defends McClean after controversial Rice tweet”.